Having the right tool system for the job is an essential part of any application. We engineered our 3M? 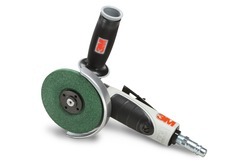 Grinders to power abrasives and accessories ? making your cutting, grinding, blending or finishing jobs fast, easy and efficient. T-27, 4-1/2 in Grinder with guard to be used with 4-1/2 in Bonded, Coated, and Surface Conditioning Products. Removable side handle furnished with tool. Guard can be positioned for greater surface visibility. 3M Gripping Material molded into tool housing for greater operator comfort. Right angle steel gear head with grease fitting for increased gear life. Rear exhaust. 3/8 in to 1/4 in Air Inlet Reducer included.